This past week, I was in Orlando, FL for the American Association of Diabetes Educators (AADE) Conference. While the conference was geared towards diabetes education, I was glad to see several sessions that recognized the importance of support for diabetes self-management. Two weeks ago marked my second trip to the annual American Diabetes Association conference. Held in San Francisco, the conference brought together experts from around the world to tackle the most pressing issues in diabetes care and research. As a PhD student in Health Behavior, here are my takeaways from the sessions. The ADA conference was attended by approximately 17,300 people from more than 121 countries. Anecdotally, I heard that 40% of the attendees came from outside the United States. With a “World Cup Lounge” set up on the second floor where participants could watch live football matches, this was not hard to believe. 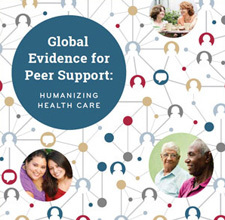 Peerness and trust are key ingredients for successful peer support programs and community health worker (CHW) interventions. However, when peer supporters and CHWs lack the resources they need to achieve program goals, their hard-earned trust in the community erodes and they become demoralized. Such setbacks can prevent these frontline workers from reaching their potential as agents of change for community health.